A passenger has been taken ill on board a ferry after it departed, causing delays. 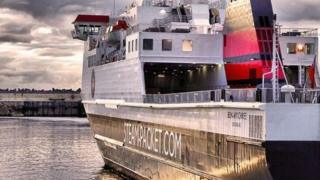 The medical emergency was reported after the Isle of Man Steam Packet's Ben-my-Chree service to Heysham in Lancashire departed at 08:14 BST. It returned to Douglas and the passenger, whose condition is not thought to be critical, was taken to hospital by ambulance. The ferry returned at 09:00 and has since departed for Heysham.